As society begins to change their perceptions of gender, and the roles individuals take in the workplace changes, sexism has been decreasing. However, there are still biases that individuals carry in male-dominated careers. I have done co-op placements at automotive shops and am now a student in materials engineering and have occasionally been met with biases against my gender. Unfortunately, based on my appearance, I am not always greeted with the same initial respect as my male peers. There have been times where I have to work harder to prove my skill and intelligence, and show that I am capable of the tasks at hand. It can be very discouraging to be met with such dismissal of my competence and to be continuously challenged. I would not be where I am today if I would have kept quiet and not challenged their perspectives of me. I am passionate about the career path I am pursuing and am glad I did not give up my dream of being a materials engineer. If there is anything I’ve learned through my journey, it is don’t be discouraged when people doubt your capabilities. If you are passionate about a career goal you can go far if you persevere, no matter the obstacles presented. I have become part of a design team through school called Formula UBC Racing, where each year we build a car and compete in the Formula SAE competition in Michigan. I am on the Materials sub-team and this has presented me the opportunity to manufacture components for the car. I have mainly been working with dry carbon fiber and performing wet layups of aero body panels and other projects. I have loved every minute of this hands-on experience and am grateful that pursuing materials engineering has given me this opportunity to learn and advance my knowledge of materials. 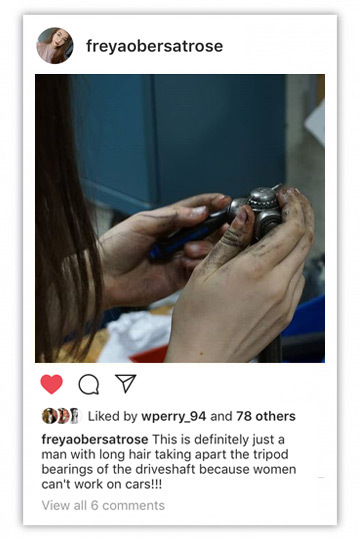 Freya is a 20-year-old Materials Engineering student at the University of British Columbia. When she earns her degree, she wants to work with composites in the renewable energy field.